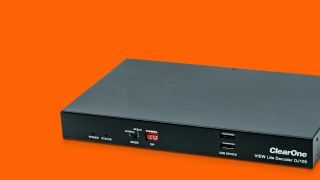 The What: ClearOne has announced the availability of VIEW Lite control modules for Crestron and AMX control systems. The software modules are designed to make AV projects with multi-display video walls and other equipment easier to deploy by decreasing the effort required to program the control system. The What Else: The VIEW Lite control modules for Crestron and AMX provide a ready-made template for integration of equipment with ClearOne’s VIEW Lite Controller for AV-over-IP systems. Each of the software modules is implemented as a common core plus a helper component to provide video wall support. Both modules have the ability to interrogate the VIEW Lite hardware they control to discover its configuration. They also both support two-way feedback for video layout switching. In addition, the software package includes a sample GUI that illustrates how to use the control modules. The Bottom Line: Instead of reading through complicated API documentation and building a control module from scratch, integrators can use the VIEW Lite control modules to save time and effort. Because the control modules implement all the required command interfaces for VIEW Lite, these modules enable integrators to focus on developing an attractive and intuitive GUI for users of the system.